U.S. Sen. Bob Corker answers questions from reporters after speaking at a luncheon hosted by the Rotary Club of Cleveland at the Museum Center at 5ive Points on Tuesday, Aug. 15, 2017, in Cleveland, Tenn. Corker took questions from rotarians about current events on topics including North Korea, healthcare and President Donald Trump. U.S. Sen. Bob Corker, R-Tenn., said the bust of Confederate General Nathan Bedford Forrest should be removed from Tennessee's state Capitol and put in a museum. 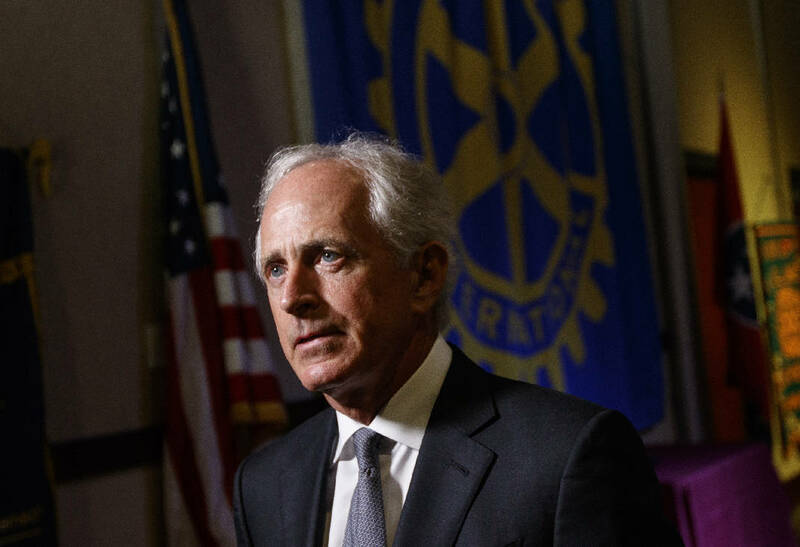 Following a speech today to the Cleveland Rotary Club, Corker said the statue of Forrest, an early leader of the Ku Klux Klan, is not an appropriate symbol in the Capitol where all people of Tennessee come to make governing decisions for the state. "This is a state issue and not something that I am involved in, but if I were in the General Assembly I would vote to remove his bust from the actual Capitol where our ideals of a state are debated," Corker said. "I would support removing those type of historic symbols that are contentious to our people and putting them in museums, not in places where our ideals are lifted up." 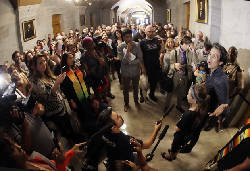 Corker's comments came a day after protesters in Nashville Monday urged Tennessee legislators to vote to remove a bust of Nathan Bedford Forrest from the state Capitol building between the House and Senate chambers to Gov. Bill Haslam's office. Haslam has also urged the Legislature to vote to remove the Forrest statue. Under legislation approved by the General Assembly in 2016, removing the bust requires a two-third vote from the Tennessee Historical Commission. 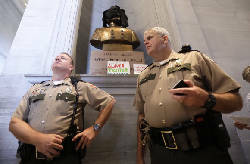 The protest Monday in Nashville over the Forrest bust at the Capitol came following a fatal demonstration Saturday in Charlottesville, Va., where a female protester was killed and two state police officers died in a helicopter crash during a protest by white nationalists over the move by the city of Charlottesville, Va., to remove a statue of Confederate Leader Robert E. Lee. Corker called the incidents in Charlottesville, Va., over the weekend "despicable and something none of us should support." "People in a free country have the freedom under the first amendment to express themselves anyway they want, but I want no part of it," Corker said. "Our nation is better than that. I hope that the outcome of this is that there has been a significant push back [against white supremacists and KKK or Nazi followers] from the community."